In the United States, the Food and Drug Administration (FDA) regulates the manufacturing and market release of human and animal parenteral drugs, biologicals and medical devices. Other countries have similar regulatory agencies that, like the U.S. FDA, are tasked with monitoring and therefore assuring the quality and safety of products. The FDA reviews new drug applications or changes to already approved products. If the product will come in contact with the blood stream or cerebrospinal fluid, the product submissions must include endotoxin testing results indicating that the product has an endotoxin content below its allowable endotoxin release limit. The United States, European, Japanese and other Pharmacopeia publish product monographs that provide endotoxin release limits for many products. In addition, test chapters are published that define the requirements for conducting a Bacterial Endotoxins Test (BET). In the U.S. Pharmacopeia (USP), the BET chapter is Chapter<85> and it has been, to the extent possible, harmonized with the BET chapters in the European and Japanese Pharmcopeias. U.S. FDA inspectors audit pharmaceutical companies based on the USP requirements. The FDA regulates LAL not because of what it does, but because of where it comes from, i.e., the blood of an animal. The original LAL/TAL method is the gel clot method. In this method equal amounts of a test sample, for instance an injectable chemotherapy solution, and the gel clot LAL/TAL are mixed in a test tube. The combined solution is incubated at 37 °C for 60 minutes. After the incubation, the tube is inverted. 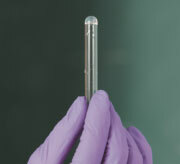 If sufficient endotoxin is present in the test sample, the solution would have clotted during the hour incubation and a gel will remain in the bottom of the inverted tube (see image). If the sample does not contain detectable endotoxin, no clot will form and liquid will run down the side of the inverted tube. The gel clot method is still widely used throughout the world. It provides a yes/no answer to whether a sample contains a specified amount of endotoxin. Additional LAL/TAL methods have been developed that are used to quantitate the amount of endotoxin in a test sample. The methods use software and instruments to monitor changes in the test sample/LAL/TAL mixture that are the result of endotoxin in the solution. Endotoxin standards at different concentrations are tested either at the same time as the test samples or in advance of them. The LAL/TAL response to the test samples is compared to the response to the endotoxin standards in order to determine the amount of endotoxin in the test sample. In the kinetic turbidimetric LAL/TAL method, a 96-well plate reader or tube reader is used to monitor the change in solution clarity as a result of endotoxin present in a sample. The solution clarity or turbidity change is due to the formation of the gel in the well or tube. The faster the solution changes, the more endotoxin in the test sample or standard. The standard curve is plotted, typically on a log scale, as time (on the X-axis) and endotoxin concentration in Endotoxin Units (EU) or International Units (IU) per ml (on the Y-axis). The reaction time of the test sample is compared to the standard curve and an endotoxin concentration is calculated. Two LAL/TAL methods use a chromogenic substrate to detect the presence of endotoxin in a solution. Rather than monitoring the change in solution turbidity, the kinetic chromogenic method monitors the change in color in a solution. More endotoxin, means the solutions in the well or tube turn yellow faster than solutions containing less endotoxin. 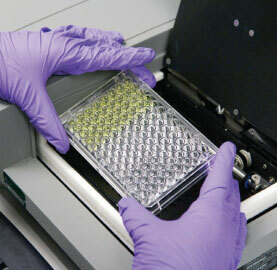 The endpoint chromogenic method uses a fixed test time and the intensity of yellow color is used to distinguish between levels of endotoxin. Advancements in how the LAL assay is performed have taken pressure off of the horseshoe crab population. Charles River Laboratories has developed the Endosafe® nexgen-PTS™, a rapid, portable point-of-use testing systems that provides quantitative LAL test results within 15 minutes through their unique cartridge technology. This FDA-licensed cartridge technology uses 20 times less raw material than traditional LAL tests, which significantly reduces the amount of LAL per test and minimizes the need for retesting that is often necessary with traditional methods, while still adhering to approved regulatory requirements.